Home / 2014 / July / 23 / You will eventually own a smart watch. For the past ~year – the time since Pebble made headlines for its crowdfunded success – people have been hyping smart watches. It’s becoming annoying if you are like me and comb gadget blogs. Well, not really annoying, but not particularly exciting. During the hype, I have been skeptical of the utility of these new devices given there are activity trackers, phones, etc, which offer the same functionality with more power. It’s been tried before and it’s weak sauce. 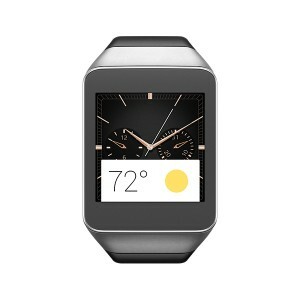 I had my heart set that smartwatches are cute gadgets but they are not very useful. I mean, you have a cell phone already, right? After spending some time with Android Wear, I’m sold, these are going to become very popular because they are useful. I’ll try and explain how in this blog post. 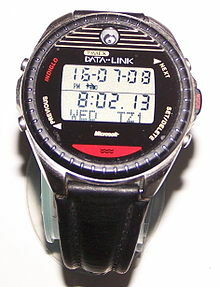 I’m not sure I’d really call it a smart watch per-se, but the Timex Datalink was the first watch I ever had that I could communicate to a computer with. This watch was pretty awesome at the time. I vaguely remember making an eager sojourn to the EB Games (Babbage’s, for you in the UK) in the local mall. I picked up some sort of giant package for this watch thing that I had forever lusted over and done random jobs fixing computers to earn. I knew every imaginable thing that a 14-year old nerd can know about an obsessed-over gadget. Here’s why I was obsessed with the Timex – it was a technological marvel. Because the connectors on computers were too big (RS-232 or parallel? Nerd, please! ), the Timex Datalink used a photosensor as a sort of crazy modem that would receive address book information that you could input on a PC using proprietary software. To download the data to the watch, you would hold your wrist up to the CRT screen and the screen would strobe to transfer the data. The flashing was awesome. It was like a rave for your watch! The software transfer method was a potentially fatal epilepsy hazard though. Sorry, that got dark fast. I don’t think there were ever any Timex Datalink-related epilepsy incidents but the communication software was pretty crazy in terms of strobing. Anyways, this whiz-bang gadget of the 90s was a true marvel of its time. You no longer needed a calculator watch to carry around your contacts with you and you didn’t have to look like a complete geek just to keep all your contacts with you. Hold on.. I take that back, this watch is about as nerdy as it gets. It was a completely dysfunctional device that was just as much impractical. For one, you would lose functionality when you didn’t have a computer around. For another, why reinvent the wheel for the sake of making it digital. Alan Cooper would have a joyous time wondering at the complexity of the thing. I really wish I had a video of the unboxing, it would be hilarious to see. I opened up the blister packing and installed software using floppy disks because CDs were too bougey. After the app installed on Windows 95, I manually input all my contacts using the horrid WinForms client app like a data entry specialist, and stared transfixed as the flashing CRT downloaded the data from my PC. The technology was mind-boggling at the time and I proudly wore the watch for a few months, giving my fellow nerds the smug grin of science in passing. The wonder wore off before long though. The tipping point on it was when my friend asked me why I had it. I started explaining myself and then he pulled out a notepad and pencil, scribbled down names, addresses, and phone numbers, and proved this smartwatch thing was obsoleted by low tech. The watch is gone and I don’t miss it a bit aside from the nostalgia of the thing. Naturally, the SPOT watch never took of f.
I completely randomly was a beta tester on the Microsoft Spot Watch around 2003-2004. The device I had was large for a watch and had a square display similar to a Nokia 3390 but with a circular shape and a giant LCD bezel. The device used radio to receive notifications such as weather information and some sorts of MSN alerts like sports scores, stock quotes, and news headlines. I don’t remember caring at all about using the thing, I had most likely participated because I just wanted to see what Microsoft was like and to play with new toys. In fact, I remember scoffing at the idea of the device because I then was rebelling against commercial software and *cough* Microsoft sometimes can be considered the villain in that narrative. I can’t say I wasn’t curious though. I used the watch regularly over the course of the program. My conclusion: it’s neat but the information I was getting from the device was useless – I didn’t care about the weather in Seattle, it’s cloudy, duh. The MSN notifications were also pretty useless because I could have cared less about what was going on outside of where I was. After some time with the watch and a number of feedback sessions, I found myself impressed with what it did but bored at the same time. There was also the factor that social networks were virtually non-existent at the time and notifications from Facebook / MySpace were done through email and nobody cared anyways. I did have a feeling that Microsoft was on to something. When the production devices came out later, I watched from the sidelines because there wasn’t that much value to the thing and there were service fees tied to the device. I’d wager Microsoft was doing something crazy / prohibitively expensive like leasing radio time from radio towers (or satellites?) to transmit the signals. I nearly joined the SPOT team during a mass exit around 2007 when the Digital Media Division at Microsoft was disbanded. Upon inspection, the team was clearly being defragged so I instead started working on Windows touch features. I had been interested in the Motoactv when it launched but couldn’t justify the starting price. Later, I was looking at GPS Sport Watches and the Motoactv looked pretty good considering it was a tracker with support for phone connectivity and music. Motorola had also just slashed the price of the Motoactv. If you’re thinking what I’m thinking at this point… Then you are thinking that Motorola did their market research. Yup, I bit. I impulsively scooped up the gadget and felt buyer’s remorse creeping up on the drive home. I calmed myself and rationalized the device as an activity tracker — I really just needed a run / bike tracker — how bad could it be. At first use, I was very disappointed. The battery life was bad. I could get what felt like 8 hours of battery life with minimal use. I took a deep breath, again, this was a watch-sized Android device, what could I expect. I wasn’t blown away by its looks either – it was a giant watch, heavy. I then started to appreciate the thing. At the end of the day, the device got the job done of tracking runs and counting steps. A FitBit or a GPS Sport Watch would accomplish either of these tasks far better than the chimeric Motoactv. Over time, I realized the Motoactv really was not at all what I expected it to be: it was entertaining. It played music and functioned as a bluetooth headset really well. The included headphones were better than any other athletic headphones I own. As others have discussed, it was a good fitness gadget in its own right in this sense. There really wasn’t much like it out there at the time. I still was annoyed by the device though. The battery life was dismal. For what the Motoactv was to me, I could not justify having to mess with the strap and find an extra micro usb cable to charge it when it was dying in the middle of the day. Half the time I wanted to use it, the watch was dead. Then Motorola released a Motoactv firmware update that made a significant difference in device battery life. Under ideal circumstances, I could get battery life on the device that could last just as long as my phone with room to spare. The device also charged faster. I feel like I should repeat that again, Motorola performed some sort of firmware witchery and more than doubled or tripled the battery life of their wearable and made the update free for everyone. I was stoked, my rather decent fitness tracker was now reborn better and even on par in terms of battery life with the devices I compromised on to get the shinier tracker – let’s face it, an active-matrix touch screen of the Motoactv’s size doesn’t come at zero cost to battery life. Later, Motorola released an app that would let you sync messages from your phone to your watch. This app was amazing in concept. 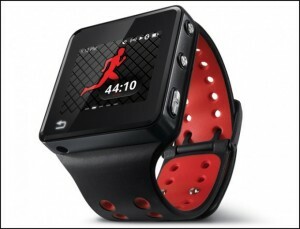 Receive texts, tweets, and Facebook messages on your Motoactv watch. When it worked, this feature was a game changer. However, it barely ever worked for me. Every once in a while the app and watch would start dancing nicely together and I would simultaneously get important notifications on the watch and my phone and could just verify the notification on the watch. Then, when I most needed it, all my notifications would break. I however was still a huge fan, the Motoactv convinced me that this was at least nifty and cute. If it worked perfectly, it would have been amazing. The impact on battery life and the Schrodinger’s cat game with my notifications was too much. Maybe it was too soon for the market or maybe the bridging between Android and the device was impossible at the time of design. To sum it all up, something about the device was not quite seamless enough to be perfect. Over time, the watch became a cult classic. The touch screen was decent, the screen itself was actually pretty good looking. Eventually, a rag-tag team of Android enthusiasts hacked the device and gutted some of the less-used watch features. The results were astounding – some users claimed a week of battery life with the lean and mean updates. Developers integrated apps and games – even Angry Birds made it to the device. I enjoyed my Motoactv. It was big, it was clunky, but hot dang it was a glympse at the future. I wore the thing as a fun wearable and very regularly as a runner / mp3 player. Sadly, I dropped it just the wrong way after a workout and shattered the screen. That was the end of it for me. I wasn’t too upset to lose it though, my phone did everything it did and more. I mean, MP3 player and fitness tracker, phones do that well enough to make it difficult to justify another device. The thing was big and ugly too, definitely the Nokia N-Gage of smart watches contemporary to its time. For I/O 2014, I was fortunate enough to get access to an Android Wear Smartwatch. The device was inactive when I received it and I did not get it functioning until a while after the event. In fact, I left it unused for more time than I typically will give a gadget. I was disinterested due to my experience with battery life in the early Motoactv releases and the whole notification roulette that made me nervous about wearable notification reliability. A coworker who is extremely skeptical of early technology trends told me he found the device indispensable. He described a scenario where couldn’t use his hands but was still able to receive and respond to texts without distraction using just a glance and voice commands or canned responses. I decided to give the little watch a second chance. Pessimistically, I charged up the watch and waited while it booted. Within a few minutes I was bridged between my phone and the watch. It was pretty dang seamless. Later, I received a hangout message, “Want to meet for lunch?” – I touched the screen, distrustingly slid up the voice input. The canned response “yes” appeared first, nice. Click, send, done. At this point I got it. That whole process of: Remove phone from pocket » Look at screen » Unlock screen » Find app / select notification » Read or respond. The watch fixes it. This was the first time the watch delighted me. Everything that kept the Motoactv from being a game-changer was there in that one simple interaction. A repetitive task that I perform on my phone just was optimized by a noticeable margin. I feel my wrist vibrate again, open the watch, and then I see the Google Now notification that a package was delivered. Yes, I know what you’re thinking. I also got this notification (redundantly) on my phone. The key point is that the check / dismiss interaction pattern on the watch is much less disruptive than the phone pattern you perform to accomplish the same thing. By the end of the first day I used it, I had become confident with the device. I experimented with sending messages using voice. It just worked. By this point, I would not give up the device without a fight, I was committed to the cult of the smart watch. On the end of the second day I had the watch, I returned home from work and tapped my phone to my Moto Stream. After listening to music for a few minutes, a duplicate track showed up in my playlist. I reflexively looked at my watch intending to do something and before I realized I couldn’t, I saw an icon that allowed me to skip tracks with my music. Delighted again, I skipped to the next song and from the watch. It’s a subtle thing, but having seamless music control from a watch is pretty darn awesome. Later, I was testing my video of a San Francisco bike ride last weekend on my TV using my ChromeCast. Somewhere along the lines, I wanted to pause and check to see if a task was completed on my computer. I checked my watch to see whether enough time had passed and delightfully, there was a new notification: I could control the ChromeCast from my wrist, no apps or configuration necessary. This is why the watch, like the ChromeCast, is a game changer. It’s easy to use, works with minimal configuration, and is useful. Trust me, smart watches are here to stay and if you’re reading this there’s a good chance you will inevitably own one and will find it indispensable.